Toronto, December 6, 2016 – Probe Metals Inc. (TSX-V: PRB) (“Probe” or the “Company, is pleased to announce results from the ongoing drilling program on its 100% owned Val-d’Or East project (the "Project") located in Quebec (see table 1). In addition to further definition and delineation of the East-West–trending gold-bearing quartz-tourmaline vein system, drilling was also successful in discovering a new high-grade gold zone hosted by diorite dyke, similar to that of the past-producing Beliveau Mine. Continuity of near surface mineralization continues to be demonstrated with some impressive intervals in the first 150 meters of depth, with the best intercept returning 2.0 g/t Au over 143 metres, including 35.1 g/t Au over 4.2 metres, in Hole PC-90 (true width approximately 70% - 90% of drill interval). The new gold zone was intersected by an infill drill hole, DDH PC-90, which was originally designed to test for higher grade mineralization within the east-west-trending quartz-tourmaline vein system. At approximately 400 metres depth (down-hole) a north-south-trending diorite dyke containing numerous zones of significant disseminated pyrite mineralization and quartz-tourmaline veins, similar to that hosting the former Beliveau Mine, were intersected and traced down to over 800 metres depth down hole. The true width of these zones is not known and will require further drilling to determine. The presence of strong gold mineralization in the diorite dyke at these depths indicates that the east-west feeder system is active at these levels and bodes well for further expansion along strike, away from the dyke, at these depths. 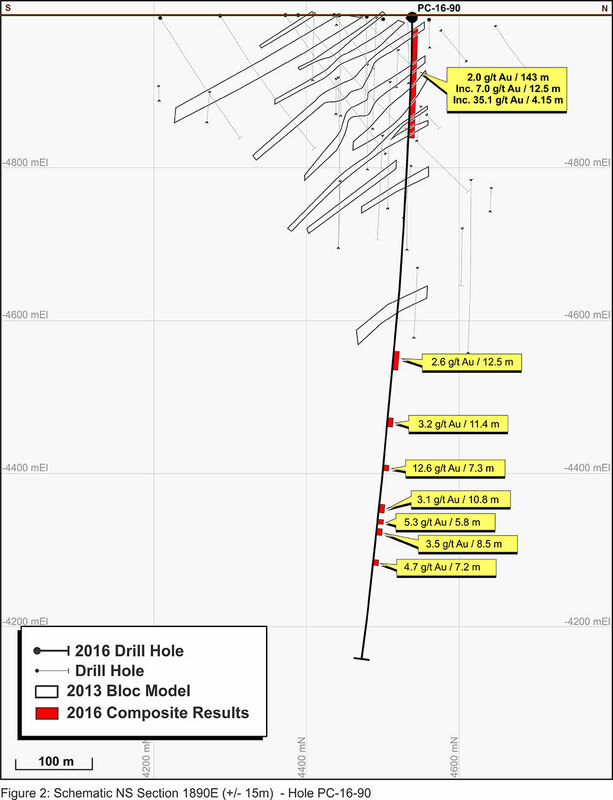 In addition to the new zone, the higher-grade quartz-tourmaline vein mineralization originally targeted was also intersected at shallow depths in Hole PC-90, returning an impressive 2.0 g/t Au over 143 metres starting at 15 metres depth (down hole). Other highlights of the near-surface vein system include: 2.5 g/t Au over 25.5 metres in Hole PC-86; and 3.0 g/t Au over 16.0 metres in Hole PC-88. Results from this first-phase drilling program are very encouraging, and indicate increased potential for both near-surface bulk tonnage and deeper, higher grade mineralized systems. Results also demonstrate the continuity of the gold mineralization and therefore the potential for significant new mineralization laterally to the west and east of the known mineralization. (2) For all other rock types, true thickness is currently estimated to be between 70% to 90% of drill length. David Palmer, President and CEO of Probe, states: “Initial results from the drilling program have definitely validated our confidence in the Val-d’Or East project and highlighted its significant exploration upside and potential for expansion. To come up with a new discovery so soon after the combination of Probe and Adventure Gold is not only a testament to the project but also the dedication of the new exploration and management team. We look forward to continuing the success on Val- d’Or East, as well as our other projects, as we ramp up our exploration activities. With the bulk of our land consolidation strategy achieved, we will now be able to focus more effort on our exploration programs and generating results”. Following the discovery of the new zone, surface drilling has been expanded to better delineate this mineralization and test for its extensions. Two drill rigs are currently in operation on site testing the new zones. 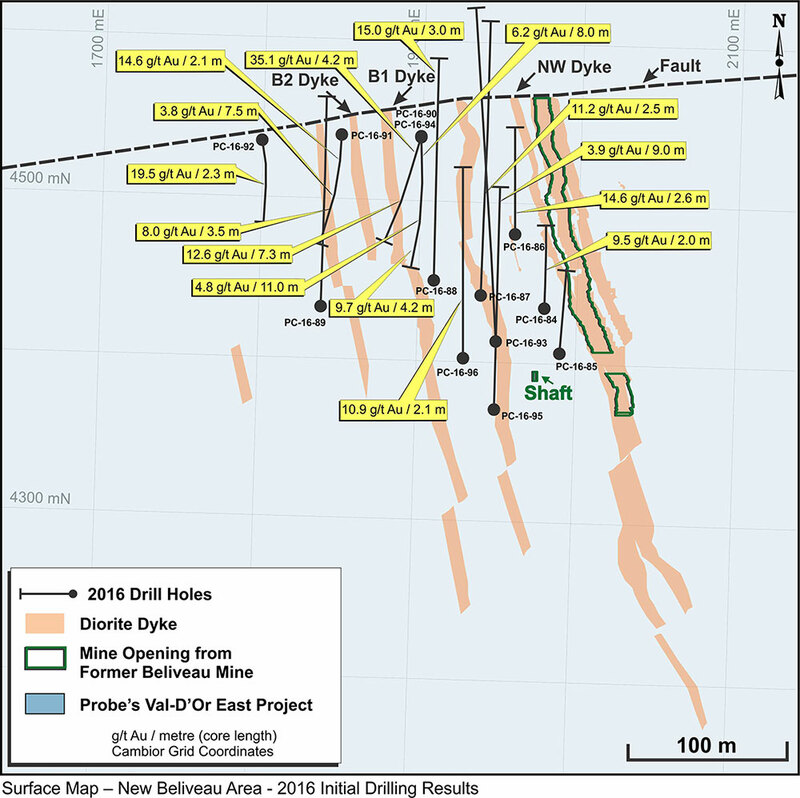 The results announced today are from 5,600 metres of drilling, representing 13 drill holes. Drill results from the ongoing drill program will be disclosed as they become available. In addition to drilling, the first phase of a property-scale IP survey has been completed and is currently being interpreted. The Company intends to commence drill-testing of the new IP anomalies in Q1-2017 with the addition of a third drill. The New Beliveau deposit consists predominantly of a series of parallel, east-west trending, moderately dipping to the south mineralized zones hosting gold-bearing quartz-pyrite-tourmaline veins. Gold mineralization occurs in the veins but also in their immediate wall rocks. The sulphide content is generally 1 to 5%, but may reach up to 10% in the higher-grade sections. The extent of the alteration zone, which consist of a mixture of quartz, tourmaline, dolomite, albite, and euhedral pyrite is commonly twice the thickness of the vein itself. The north-south-trending diorite dykes also contain significant gold with gold grades typically increasing in areas where the dykes are intersected by the east-west quartz-tourmaline veins. Wall rocks for both systems consist of intermediate volcanics rock. Together with the Highway and North Zones, the New Beliveau Deposit host a NI 43-101 inferred resources of 770,000 ounces at 2.6 g/t gold calculated at a 1.0 g/t cut-off above 350 metres depth and 1.5 g/t cut-off below 350 metres depth (see NI 43-101 technical report: Mineral Resource Val-d’Or East Property - January 4, 2013). The scientific and technical content of this press release has been prepared, reviewed and approved by Mr. Marco Gagnon, P.Geo, Executive Vice President of Probe, and Mr. Denis Chenard, P.Eng, Senior Geologist of Probe at the Val-d’Or East Project, who are "Qualified Persons" as defined by National Instrument 43-101 - Standards of Disclosure for Mineral Projects ("NI 43-101"). During the last drilling program, assay samples were taken from the NQ core and sawed in half, with one-half sent to a certified commercial laboratory and the other half retained for future reference. A strict QA/QC program was applied to all samples; which includes insertion of mineralized standards and blank samples for each batch of 20 samples. The gold analyses were completed by fire-assayed with an atomic absorption finish on 50 grams of materials. Repeats were carried out by fire-assay followed by gravimetric testing on each sample containing 5.0 g/t gold or more. Total gold analyses (Metalic Sieve) were carried out on the samples which presented a great variation of their gold contents or the presence of visible gold.